Rt. Hon. O. S. Arthur: To move the passing of a Resolution to approve the guarantee by the Minister of Finance of the payment of the principal and interest in respect of a loan by the Barbados Agricultural Management Co. Ltd. of the sum of $25 000 000.00 in the currency of the United States of America for the purpose of financing the sugar industry. Notice of this Resolution was given on 2nd March, 2007. Rt. Hon. O. S. Arthur: To move the passing of a Resolution to rescind the Resolution passed by the House of Assembly on the 27th day of June, 2006 and in the Senate on the 28th day of June, 2006 approving the guarantee by the Government of a loan of $38 million in the Currency of Barbados by the Barbados Investment Development Corporation from RBTT Merchant Bank Ltd.
Notice of this Resolution was given on 6th March, 2007. Rt. Hon. 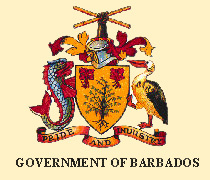 O. S. Arthur: To move the passing of a Resolution to approve the Guarantee by the Minister responsible for Finance of the payment of the principal and interest in respect of a loan of $19.0 million in the currency of the United States of America by the Barbados Investment and Development Corporation from RBTT Merchant Bank Ltd. for the purpose of upgrading the quality of the Corporation’s buildings and the retirement of debt. Rt. Hon. O. S. Arthur: To move the passing of a Resolution to rescind the Resolution passed by the House of Assembly on the 1lth day of August, 2006 and in the Senate on the 1 6th day of August, 2006 approving the guarantee by the Government of a loan of $22 000 000 by the Transport Board from RBTT Merchant Bank Ltd.
Rt. Hon.O. S. Arthur: To move the passing of a Resolution to approve the Guarantee by the Government of the principal and interest necessary for the redemption of the bond issue by the Transport Board from RBTT Merchant Bank Ltd. of the sum of $ 11 million in the currency of the United States of America for the purpose of purchasing 70 new buses. Rt. Hon. O. S. Arthur: To move the Second Reading of the Financial Management and Audit Bill, 2007. Notice of this Bill was given on 6th March, 2007. The Bill was read a first time on 6th March, 2007. The Bill first appeared in the Official Gazette on 12th March, 2007.